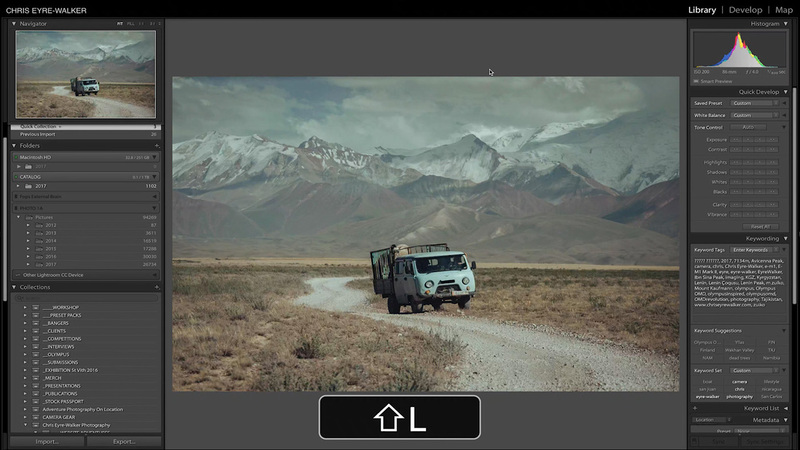 These are 10 tricks, hacks and shortcuts you probably don’t know about Lightroom or you didn’t know Lightroom is capable of. 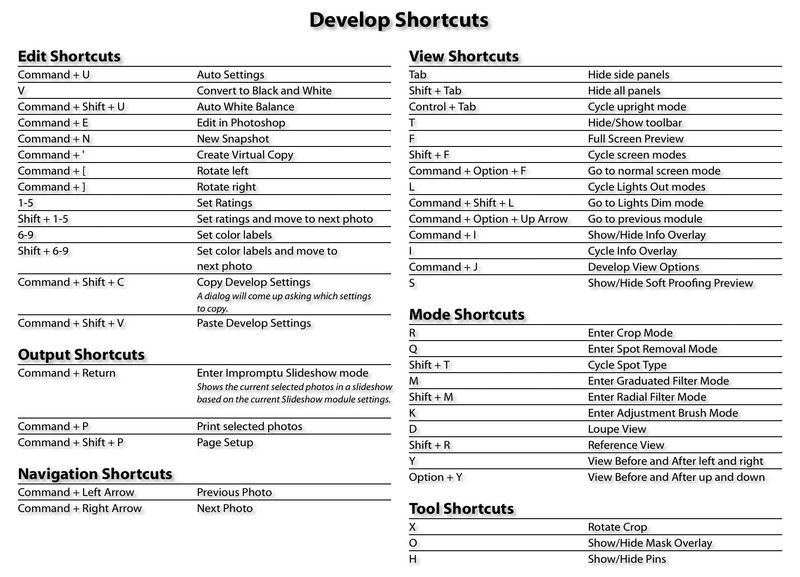 This is my list of Lightroom shortcuts and how I use them daily to improve my editing speed in Lightroom or just get around the photo editing application in a more efficient way. 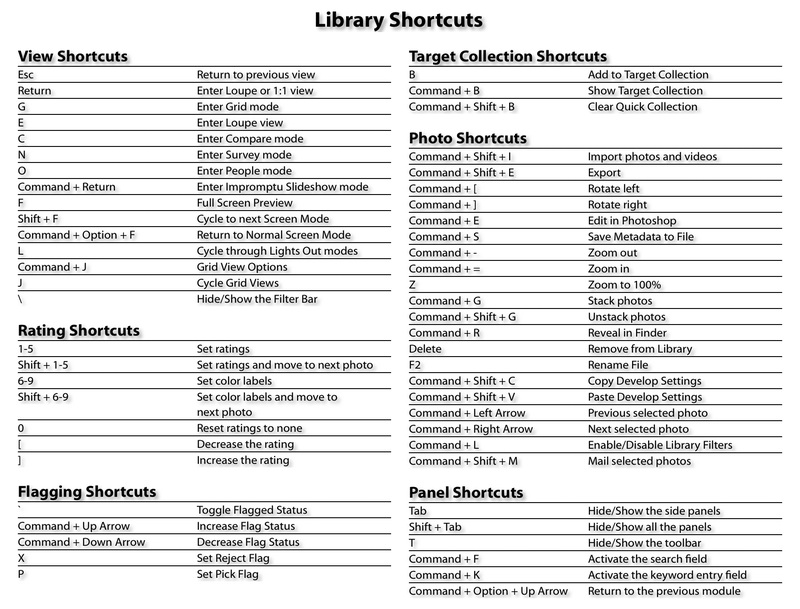 I know there’s a tonne more… but these are the ones I actually find useful and use almost every day when working with Lightroom. If you think I’ve missed a crucial one please don’t hesitate to let the know in the comments below and I’ll consider adding it to the list. E will toggle the Library Module and D the Develop Module. 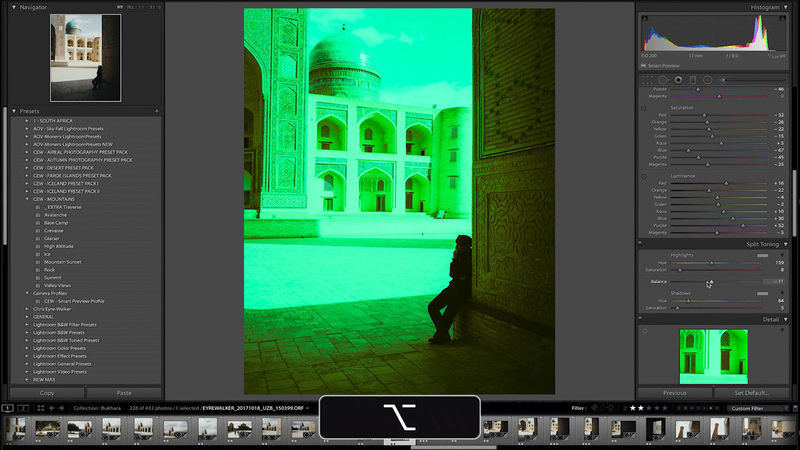 Switching between these 2 windows can greatly increase the speed of your workflow in Lightroom. For some reason Lightroom is (and has always been) much faster in Library module. So you’ll be much faster toggling back to Library module if you are trying to find the next photo you want to edit. I use this all the time. Before importing to Lightroom I usually make a 1 star selection of all the photos I like in Photo Mechanic, then I import and depending on the amount of time I have I’ll only edit every other image or so. Are you like me and use Stars and Flags a lot to filter your photos? By pressing CMD (Ctrl) + L you can toggle your last filter on and off. Super useful if you’re trying to find that shot you never edited or starred for editing. Need to look at an image without distractions? Press L to dim the lights. Press L again and they’re off. Press L a third time and you’re back to normal. Press SHIFT + L to go in reverse direction. I use this all the time. Whenever I’m happy with an edit, but I think I could do it differently or I need to match it to another image I just press CMD (Ctrl) + ; and create a virtual copy and edit it again. Nothing worse than wasting space in Lightroom. Especially when working on a laptop screen. Firstly, ALWAYS press SHIFT + F to get rid of the top grey bar (FYI press it again to go to full screen mode and again to return to normal window mode). I always turn of the panels I don’t need. In Library Module this is the right panel, in Develop Module it’s usually the left panel. Top panel is hidden at all times because I use E and D to switch between Library and Develop Modules. EXTRA TIP: Right click on the top tab and select Manual to stop it from popping in and out automatically. This works for all panels, its just the top one that annoys me the most since I don’t ever need it at all. Ever. Export selected images. I use it aaall the time. I usually keep the Quick Collection as my Default Target Collection. BUT if you’re going through a selection of images and need to shorten them down for a client, then just press B for the ones you like best and they will be added to the Collection you’ve set as Target Collection. Any collection can be a Target Collection. Just right click on the collection you want to turn into a target collection and select ‘Set As Target Collection’ , done. 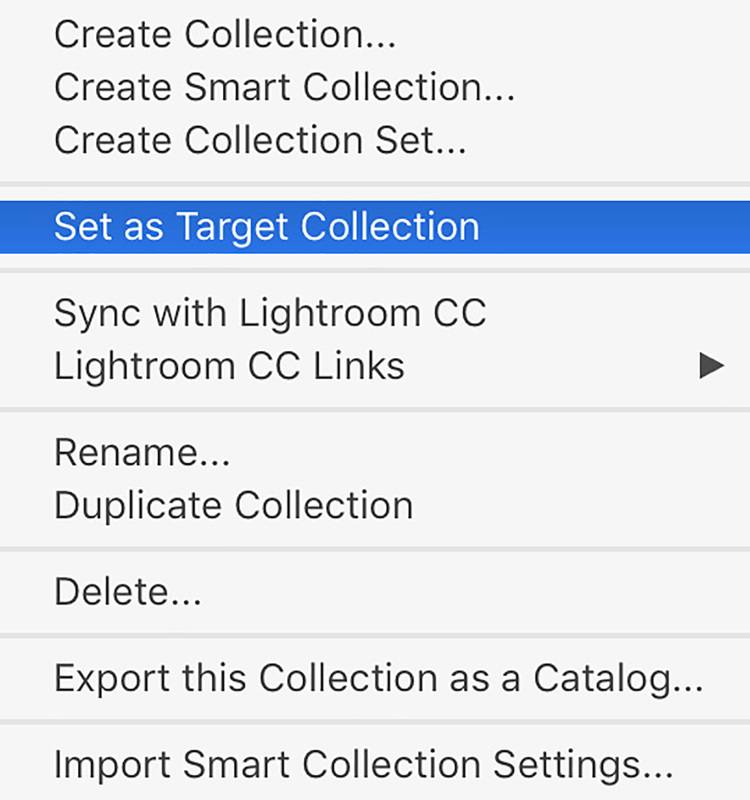 Now use CMD + B to toggle between you Target collection and the collection you’re currently sorting through. Say I have a client who wants my very best Winter Action Photos. I will then go through collections that contain Winter Action Photos and press B for all the shots I think suit the brief. Then I press CMD + B to see my Target Collection and I just remove the ones I don’t want in there anymore. (either pressing delete or by pressing B again on while selecting the photo). Again, I use this almost daily. Another great shortcut! I like synchronising my edits form one photo to another, but not always do I want the gradient or the local adjustment I applied to synchronise with it. So I just press CMD (Ctrl) + ALT/OPTION + C to copy the settings I want to take ‘with me’. 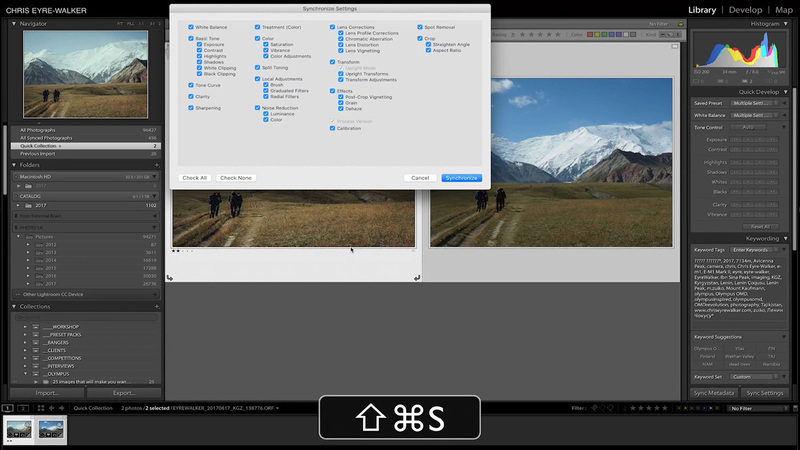 Shift + CMD (Ctrl) + S to open the Synchronize Settings panel (only works with multiple images selected on the filmstrip. + this one works in the Library Module too! Super useful! Double Click the word of the the panel to reset all sliders to 0 in that panel. (Alternatively press and hold ALT/OPTION and click once on the panel name to reset). 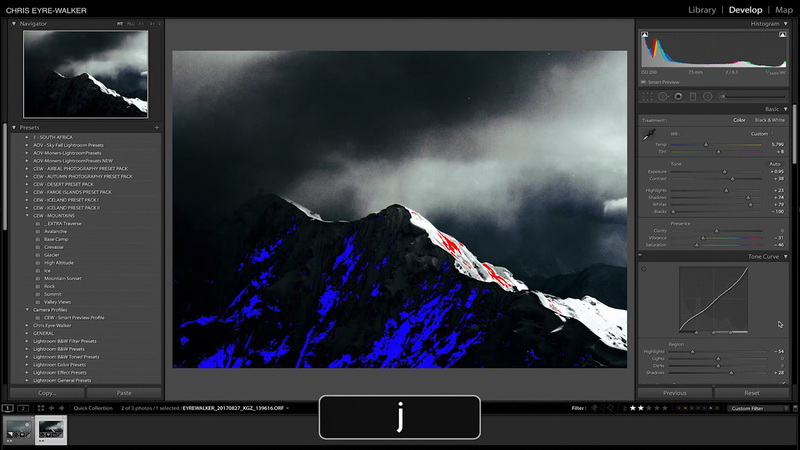 Press J to toggle the Highlight and Shadow clipping. This will who you where you’ve lost details. Be aware that if you’ve shifted the black or white point in the Tone Curve panel this won’t work. FYI, I only use this when printing photos. For web and social media use I’m not too picky about losing details in the highlights or shadows. For prints I try to retain a maximum of image information to assure the print retains as many details as possible. 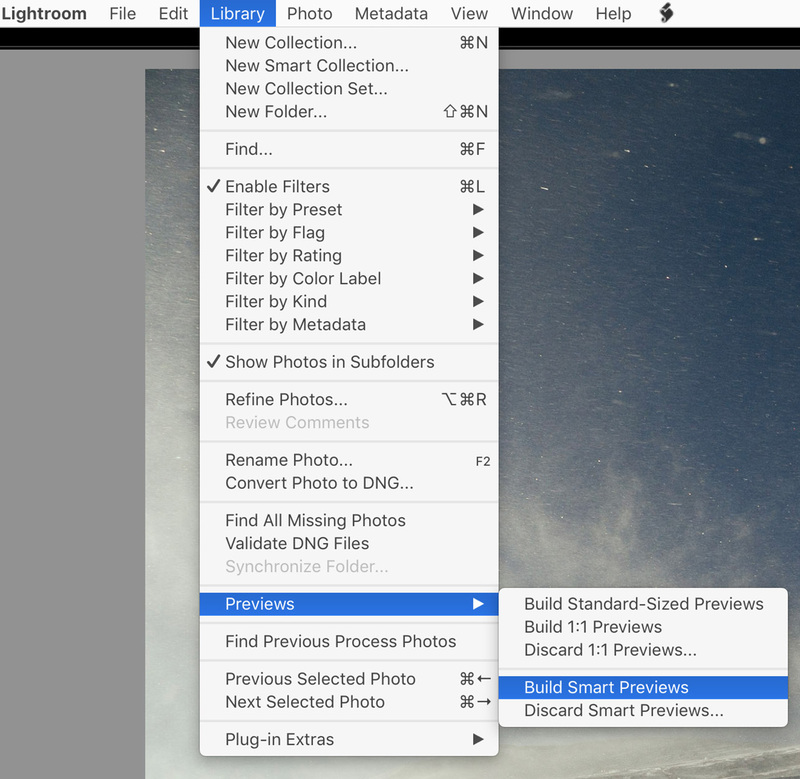 Ok, if you’re not using Smart Previews you’re probably losing out on 50% efficiency in Lightroom. What are Smart Previews? 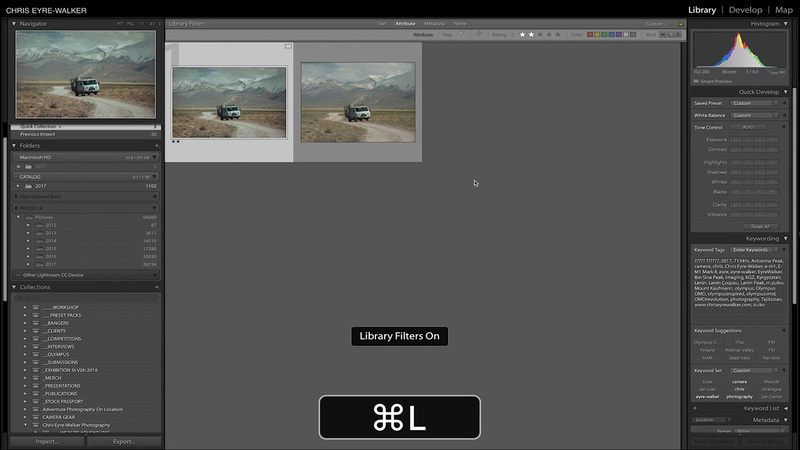 they are smaller DNG version of your images and they sit alongside your Lightroom Catalog File. But the main difference between Smart Previews and normal Previews is that Smart Previews are editable files. Yes, that’s right. 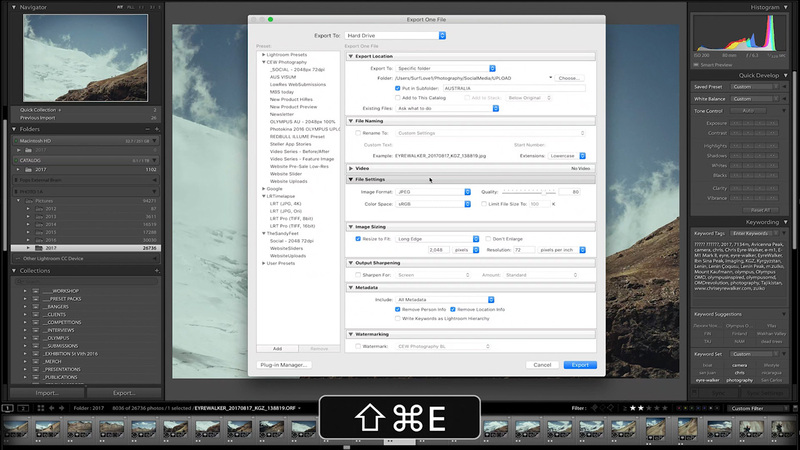 You can edit you RAW files without actually having access to them! they are smaller resolution RAW files, meaning they are much easier for your computer to handle. 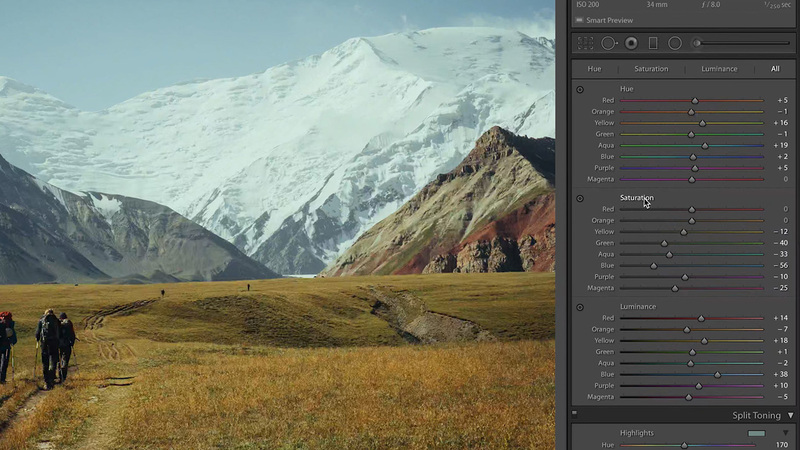 Which makes Lightroom much faster. they will automatically synchronise with the larger RAW files when these get connected. Yep. No hassle… I’ve NEVER had a Smart Preview fail on me. 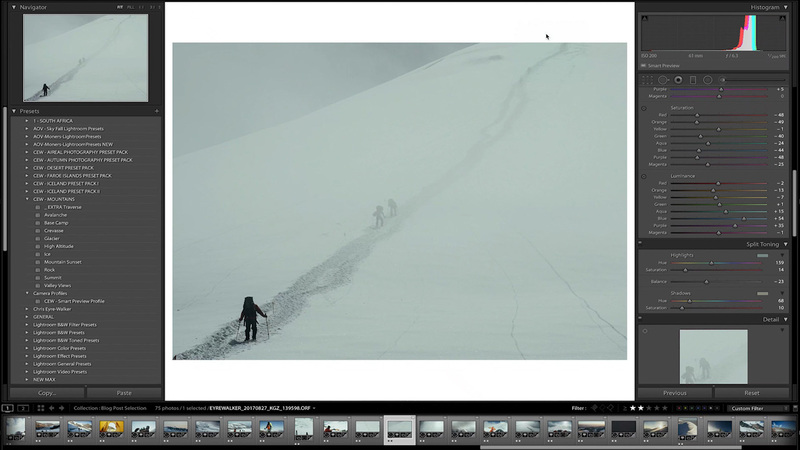 You can export JPEGs from Smart Previews in a size up to 2500px on the long side. That’s almost enough for all modern day applications (web, social media and even small scale prints!). This means, your RAW files (which you should have sitting on a different HDD/SDD anyway, don’t need to be connected for MOST of the time. Which is good, since the HDD they are on can’t wear out/fail on you if it isn’t spinning so much. seriously though turn them on and thank me later. I have my Lightroom set to generate them on import. This is because I use Photo Mechanic to import, tag, cull and organise my RAW files… but that’s a different post entirely. 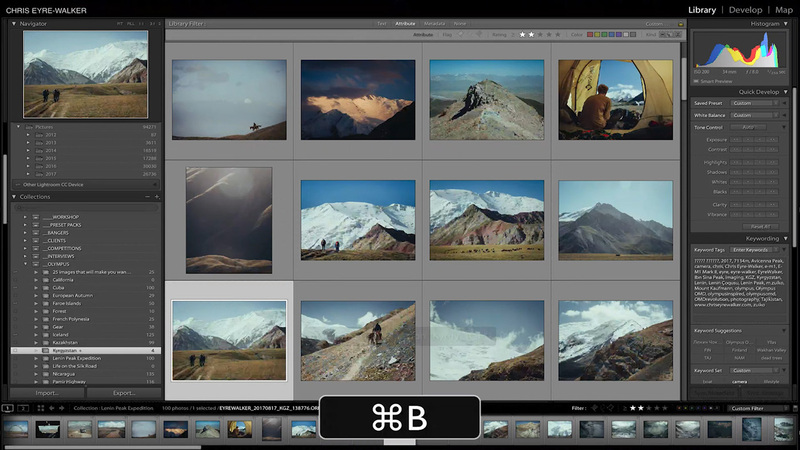 Press SHIFT + CMD (Ctrl) + I to open the Import Window and select ‘Build Smart Previews’ on the top right to ensure Lightroom will do it from now on. Ok, so you find your sliders move too fast sometimes? Just expand the develop panel a little further to the inside and it’s much easier to do ‘gentle’ adjustments. Still too fast? Hold ALT/OPTION while sliding the panel out and it will go even further. BAM! This is really great if you do a lot of portrait editing as you don’t need all that horizontal grey space on the sides of the photo anyway. I love this one! 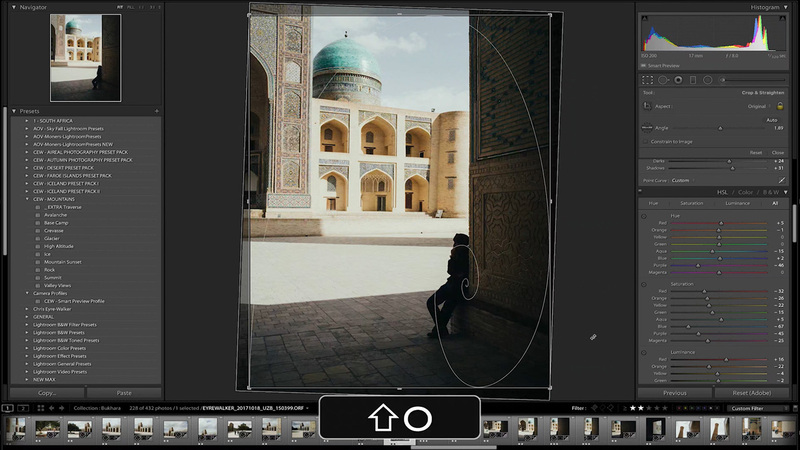 While in crop mode (FYI R is the keyboard shortcut to enter crop mode) you can toggle between different compositional guidelines (golden ratio, rule of thirds etc.) by pressing O. Even better: Hit SHIFT + O to change the orientation of some of the guide lines. Try it out.. there are plenty of options. I use it when I’m applying Graduated Filters to red skies it’s almost impossible to differentiate the filter from the actual image. By changing the colour it makes it easier to spot the filter and where it’s being applied. Like to add split toning to your image? Me too! But it’s not always easy to determine how much you’re affecting the highlights or shadows with the colour your adding. Wrong! 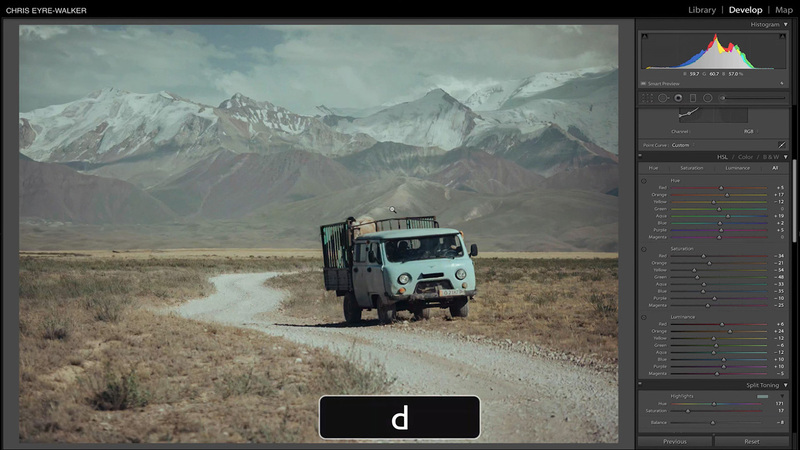 Just press and hold the ALT / OPTION key to show the mask at 100% when sliding the Balance Slider or the Hue Value Sliders. 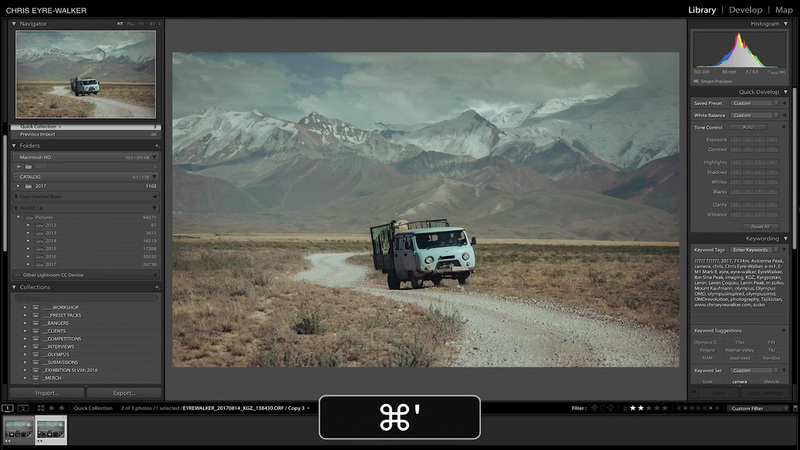 The Balance Slider will show both Highlight and Shadow adjustment at 100% Saturation, the Highlight and Shadow Hue sliders will show the respective colour at 100%. 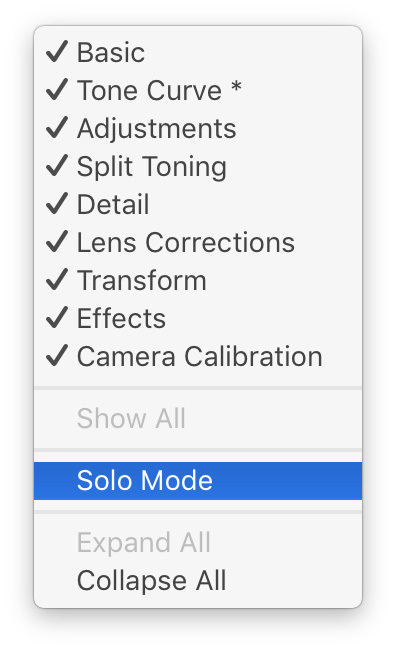 I don’t use this tool every time, but it has come in handy when I want to make sure the split toning doesn’t smell too far over into the highlights or shadows. Similar to the previous tip. When applying a Range Mask press and hold the ALT/ OPTION key on your keyboard to show the actual mask of the effect. This is incredibly useful if you want to know exactly where the Range Mask is having an effect on your image. EXTRA TIP: Also, by pressing O you can toggle the mask on and off too. 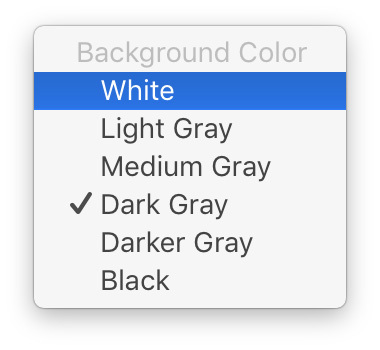 Simply right Click on the grey background area of an image and select White (or Black) to change the background colour of your Lightroom panel. Sometimes I’ve been staring at my images for such a long time that I’m shifting my colours towards one extreme. Especially in the highlights and shadows, this can look right in Lightroom, but when exported they look horrible. So I mostly try to keep my blacks, whites and greys as neutral as possible. By using a white or black background the colour shift can be very easy to detect (and fix). 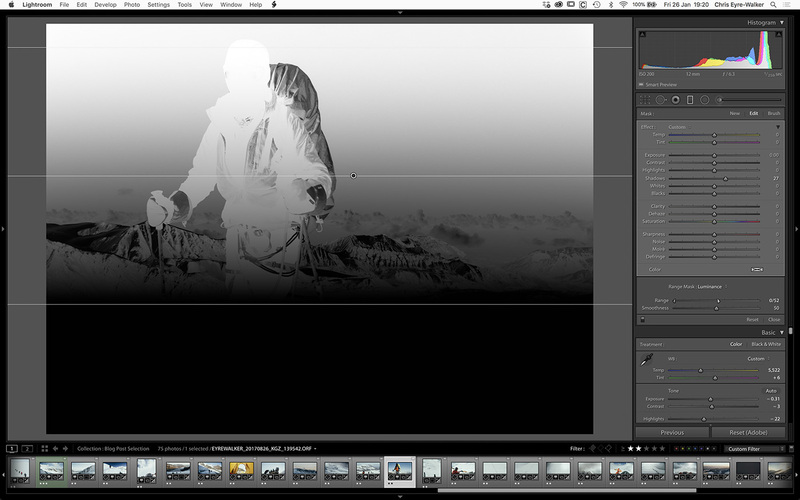 BEWARE: Split Toning can really mess with your whites and blacks. Use in moderation! Tired of scrolling through the epically long develop panels? You can make sure only the one you click is expanded and others. *FYI, I don’t use this Lightroom Hack. But I thought I’d add it anyway as I know some people like it a little more tidy. 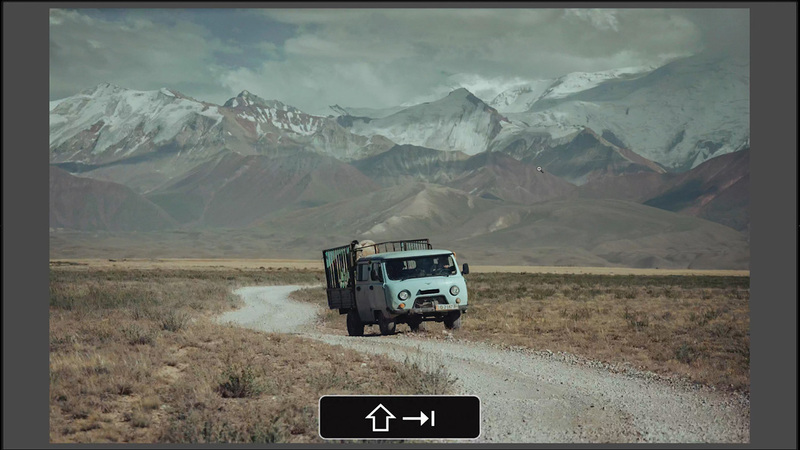 SHIFT + / shows all the keyboard shortcuts for the current module you’re in. 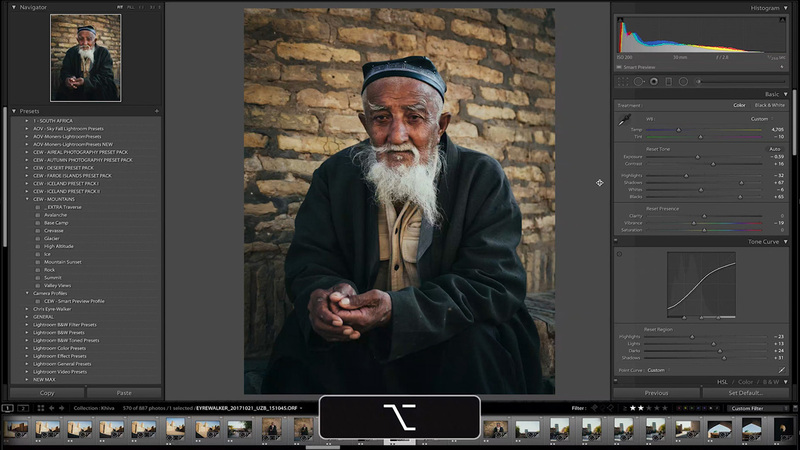 Alright, that’s it for my Lightroom Hacks. I hope you enjoyed the video and that you learnt something useful. If you think I missed a crucial one that you would definitely add to this list please let me know down in the comments below. Thanks for your amazing work! Everytime you release a new video I have to watch it instantly. Your adventures amaze and inspire me to discover the world (or at least my home country) around me! One shortcut I really like: If you are in Develop-Mode, you can press CMD + Number to quickly jump to the corresponding develop panel. Since I know this I use it every time! Go on Adventurer! Greetings from Berlin! Hey Max! Thanks so much for the kind words, it really means a lot to hear that! Great extra tip! I’ve tested it out and it works really well… nice alternative to ‘Solo Mode’.